In this article we’ve been testing a whole host of leading VPN services for use in Canada and reduced it down to the Top 5 options. We’ll be explaining their benefits (and negatives!) and looking at some specific usage scenarios to help you choose. Some complacent Canadian’s may think they don’t need a VPN in such a free and liberal country. But they’ll need to think again. Canada is part of the ‘Five Eyes’ online surveillance network, along with the US, UK, Australia, and New Zealand and your government is keen to know what you are doing online. Many Canadian’s also need a VPN to access streaming services and other content from neighbouring USA which is usually blocked in Canada. We have recently road-tested all of the major VPNs to help you choose the best service for you in Canada. In this article, we will reveal our top five and also advise you which is the best one for various different uses. Almost every major VPN has servers in Canada and offers a strong service to users there. But some are definitely better than others, which is why it is vital to do some research before you invest. Servers in Canada and the USA – While a large server network is always an advantage, for Canadians it is usually the number of servers available in Canada and the USA which matters most. Multiple apps and connections – Many Canadians use several devices to go online. If you want to keep all of these safe, you need to choose a VPN which has apps for all the major devices and allows several concurrent connections with each account too. Cost effective – No-one wants to pay over the odds for their VPN, so you should be on the lookout for a provider which offers good value for money and a decent money-back guarantee. Below you’ll find our 5 top most recommended VPN services for use in Canada. Our number one recommended VPN for Canadian internet users right now is ExpressVPN. Their all-round service ticks all of the boxes above and has plenty more to offer besides. Their server network is a substantial one with more than 2,000 servers available in 94 different countries. Crucially this includes hundreds of servers in locations across both Canada and the USA. ExpressVPN have a great range of apps for almost any device. They do only allow 3 concurrent connections with each account, but in our experience, that is enough for most people. Subscription costs are not the cheapest you will find but they still offer fantastic value for the service you get. And with a 30-day money-back guarantee you have plenty of time to try before you buy. IPVanish is another great choice for Canadian internet users, especially if you want to connect a number of devices to their service. With IPVanish you can enjoy up to ten concurrent connections with each account, meaning you can even share your subscription with family. IPVanish has the same strong encryption as the other providers on this list. They are based in the USA and they claim to offer a completely no-log service which includes no logs of your activity or your connection data. Connection speeds with IPVanish are good and they also offer a sizable server network with multiple North-American servers to choose from. There is a good range of apps too and prices are at mid-market level which still offers decent value for money. They’ve got a short 7-day money back guarantee but it should be enough time for you to get a feel for their service. If any provider challenges ExpressVPN for the top spot on this list, it is NordVPN. They can match the 256-bit AES encryption and also offer a range of additional security features that more experienced VPN users will love. These include ‘double-hop’ servers and VPN/Tor servers as well as the option of dedicated IP Addresses. NordVPN have a good size server network with plenty of servers in Canada and the USA to choose from. They allow six concurrent connections with every account and also have a large range of apps to choose from. Their prices are extremely competitive, especially if you sign up for a year or more, and there is also a 30-day money-back guarantee too. If you are new to all this VPN stuff and a bit wary of investing, then CyberGhost VPN will be the provider for you. They are the most user-friendly provider out there and their great range of apps enable users to configure and optimise their VPN settings with just a single click. They also have a huge 45-day money-back guarantee, which gives you plenty of time to road-test them for yourself and while their prices are not the absolute cheapest, they are certainly competitive. These benefits do not come at the expense of other areas of their service either. CyberGhost’s encryption and privacy protections are both robust while they also offer reasonable connection speeds too. Their server network is not the biggest, but there are still plenty of servers in the USA and Canada to choose from. They also allow seven concurrent connections too, which should let you share the service with family if you so wish. If privacy is your primary concern, then VyprVPN is what you are after. While we have confidence in the privacy protections of all the providers recommended in this list, VyprVPN is the only one to have their no user logs policy independently audited to prove its authenticity. There is plenty more to praise about their service too. Their encryption is on a par with the other providers we have recommended and while their connection speeds can sometimes let them down, they are generally speaking pretty dependable. VyprVPN has a good selection of apps and is also the only provider on this list to offer a free trial. It only lasts three days and does come at the expense of a money-back guarantee but will still appeal to some Canadian users. ExpressVPN is our top overall recommendation for Canada, but it might not necessarily be the best VPN if you need it for specific purposes. This because the right VPN can depend on what you are going to use it for. If you spend most of your time streaming movies or torrenting files then the best VPN for you may differ. Keeping data private – If you are wary of the Canadian government’s surveillance and data retention and your online activity to be private, ExpressVPN is our top pick, although VyprVPN’s independently audited no user logs guarantee runs them pretty close. Streaming US Netflix and other American content – If you plan to use your VPN to unblock US Netflix and other streaming services from across the border, NordVPN is a great choice as they can unblock just about anything. Torrenting – None of our recommended VPNs has restrictions on torrenting, but if you plan to torrent a lot, we would suggest using either ExpressVPN or NordVPN. Connecting multiple devices – If you want to connect a lot of devices to your VPN, then IPVanish’s ten concurrent connection offers you the best deal. CyberGhost VPN runs them pretty close with seven connections. 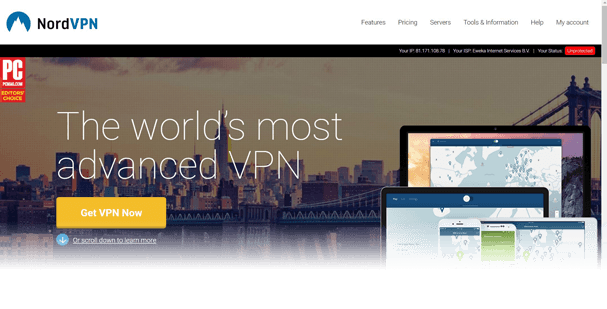 Ease-of-use – If you want a VPN that keeps things simple and is so user-friendly even beginners will have no problem, then CyberGhost VPN is the best on our list. There are a lot of VPNs on the market and it can be hard to choose the right one for you. That’s why we have done the legwork for you and tested all the major VPNs in Canada to see which is best for 2019. The results are in and ExpressVPN has emerged as our top recommendation. Their overall service ticks all of the boxes, but as we have explained if you have some specific priorities or spend most of your time doing certain things, they may not always be the right provider for you. We have therefore broken down our recommendation based on the most common uses of a VPN in Canada. All of these VPNs will deliver the basic protections you need from a VPN and with Canada’s increasing surveillance of citizen’s online activity, it has never been more important to get a VPN.